Utilising the very latest in eye scan technologies called Optical Coherence Tomography our OCT Scan provides a non-invasive imaging method allowing detailed visualisation beneath the retinal surface to detect any abnormalities in the different retinal layers, to an almost cellular level, and monitor any changes over time. 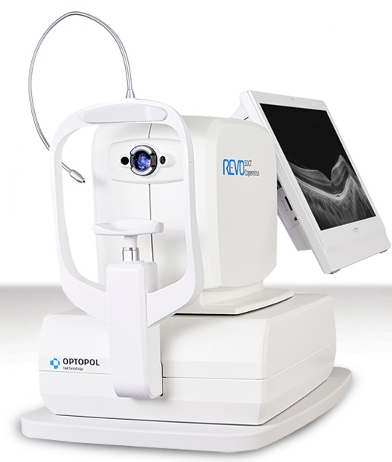 OCT Scanning allows your Optometrist to detect any abnormalities in the different retinal layers, analyse these and monitor any changes over time. Meaning safer care and better preservation of sight. Regular monitoring is key to the process as changes in the back of the eye often happen very subtly and slowly – without causing any symptoms. As such the many retinal layers should be monitored periodically with check-up scans to detect any changes from your initial base line exam. WHAT CAN I EXPECT FROM THE OCT SCAN? The scan itself takes only a matter of seconds. It is totally non-invasive, so nothing touches your eye so it’s pain and discomfort free. You will be asked to place your chin on the rest and look at a light, which may be moved according to the area scanned. The 2D & 3D HD-Scans are analysed and interpreted by specialised on board clinical diagnostic software. If necessary, further analysis can be undertaken by your Optometrist. Provides an increased chance of better outcomes for your ocular health and in turn your overall health. Please speak to any of our Optometrists if you have any other questions.